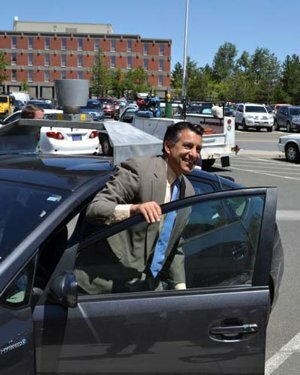 Governor Sandoval of Nevada exits one of Google's robot cars last summer. The bill he signed into law is now allowing automated cars on Nevada roads. An extended campaign in Nevada by Google has led to a new host of provisions which will allow automated cars to legally drive in the state. Starting March 1st, 2012 innovators like Google can officially apply for a new kind of robot driver’s license that will give them permission to openly test their cars on the road. Automated vehicles will be able to travel the same streets and highways as human drivers, with only a red license plate marking them as robots. Once research on those automated cars is complete (which may take years), the Nevada Department of Motorized Vehicles will issue them a neon green license plate – an indication that the robot drivers are good to go. Google, whose robotic Prius cars have already driven 200,000+ miles in California quasi-legally, will undoubtedly take full advantage of Nevada’s openness and further develop their technology for general use. Just as important, other states like Hawaii, Florida, and Oklahoma may follow Nevada’s example, paving the way for robot cars to operate all across the United States. Last June Governor Sandoval signed AB511 into law, making it explicitly legal for cars to drive themselves. That same bill, however, required the Nevada DMV to establish rules and regulations as to how companies would apply for permission to get their robotic vehicles on the road. As of February 15, those guidelines are now in place, and Nevada is ready to hand out red license plates to Google and other robotic car developers. Each vehicle will require a $1-3 million bond to insure against damages and will have to give the Nevada DMV a detailed report on what they are testing with each car. Whether or not those provisions will prove adequate has yet to be seen, but actually having concrete rules on the use of robotic vehicles goes a long way towards legitimizing them. In the eyes of Google and other automated car researchers, Nevada’s become a paradise. There is some concern however, that the new automated car law could actually stifle innovation. Under some interpretations of the bill, cars with computers that automatically engage brakes may constitute a robotic car and thus need to go through further red tape before the general public can drive them. Such systems, already developed by companies like Volvo, represent a stepping stone towards fully automated cars and it would be a shame if Nevada squashed their use just as the state was opening up further research into robotic vehicles. Nevada’s new bill will undoubtedly come with complications, but overall it is a very hopeful sign for the future of automated cars. Previously I had been very pessimistic about the legal and social hurdles these vehicles would have to clear before they could be accepted by the general public. Now, however, it seems that at least a few states are trying to prove me wrong, clearing the way for robot cars to take their rightful place on our roads. Along with Nevada, the Hawaii, Oklahoma, and Florida legistlatures are all considering bills to allow automated vehicles on their roads for research purposes (or more). The Florida bills (HB 1207 in the House and SB 1768 in the Senate) seem to have considerable support. It seems possible, perhaps even likely, that robot cars from companies like Google will be able to take over driving for humans much sooner than anyone had anticipated. Such a transition could save thousands or even millions of lives each year.